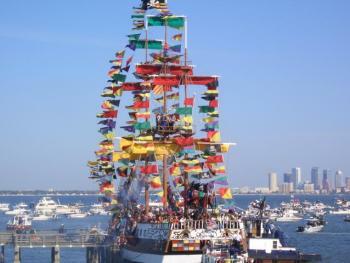 Ye Mystic Krewe of Gasparilla conquest celebration today in Tampa Bay! Today, Ye Mystic Krewe of Gasparilla will celebrate their conquest of Tampa with a festive celebration at Channelside Bay Plaza that will include live music and merriment, as Tampa&apos;s favorite pirates make ready to sail back out to sea! Check back for more things to do in Tampa Bay!